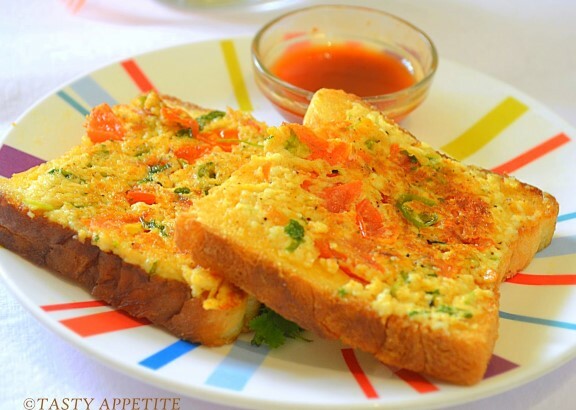 When you're craving for a super delicious easy to make snack for evening tea....then here comes the cheesy chilli toast recipe. It can be prepared in no time and serves as a filling healthy snack for breakfast too. Its very popular among kids and adults too. Try simple & easy cheese toast recipe at your home with this video recipe! Add finely sliced red and green capsicum, green chilli, tomato, pepper pwd, salt, red chilli pwd, cumin pwd, chat masala pwd, 1 tbsp of milk and finely sliced coriander leaves. Heat olive oil in frypan. Add bread slices and toast until golden on one side. Apply paneer mixture on the toasted side of the bread. Heat a tsp of olive oil on frypan. Place the bread slices with paneer topping on the frypan as shown in video. Toast it in low flame until it turns golden on both sides. Also you can toast it in oven at 180 degree celcius for 5 mins or until crispy. Yummilicious cheese chilli toast is ready. It serves as a filling delicious snack for kids and adults alike.